Benjamin Franklin Entertains: Ben Franklin's Super Dishes Bowl You Over with Big Game Taste. Ben Franklin's Super Dishes Bowl You Over with Big Game Taste. would Ben Franklin have chosen? Benjamin could cheer for Patriots. After all Boston was where he was born and lived until he was 17. Or the Eagles might be the natural choice. 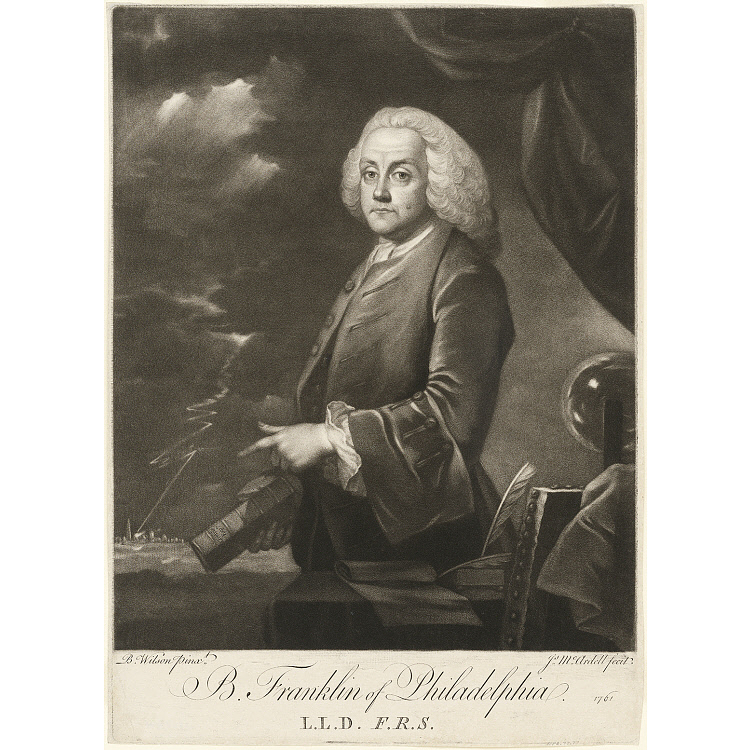 Franklin was perhaps the most prominent Philadelphian before, during, and after the American Revolution. Whichever team he might cheer for Benjamin Franklin certainly would be a convivial host. Franklin enjoyed wine, beer, punch, and good eating throughout his life. During the early days of the French and Indian War, Ben and his son William equipped the picky-eating British officers for "tailgating" with meals on the go. He made up special saddle-bag picnics which the red-coated troopers could eat as their wagons, cannon, and men moved through the Pennsylvania wilderness. Those saddlebag rations included ham, cheeses, pickles, mustard, biscuits to supplement the cornmeal and preserved "cold cuts" of the day-to-day rations. See recipes below or click through links. Franklin believed in drinking alcohol in moderation. A little of this tasty punch goes a long way. In a medium saucepan bring the water to a slow boil. Gently and very gradually sprinkle in the cornmeal and salt, stirring constantly. Lower the heat and simmer until the water is completely absorbed, stirring frequently. Coarsely ground meal will take longer to absorb the water. Set aside to cool. Stir in the flour followed by the beaten egg. Add more water bit by bit if batter seems too stiff. Drop batter onto hot griddle as for pancakes. Cook until the bottom side is browned and the top looks dry. Flip and continue cooking until browned on both sides. These delicious cakes have a soft interior and are wonderful hot off the griddle or at room temperature as a wrap for pulled pork or other meats. of parsley sage, mace, nutmeg and pepper. Combine the parsley, sage, pepper, mace, and nutmeg. Add the bacon and mix well. Cut a spiral into the meat so that it will look like a jelly roll when finished. Start at the long side of the loin and make a slice about an inch deep all the way down the length of the meat. Turning the loin as you cut to keep the one-inch thickness, continue slicing into the interior of the meat so that you end up with a flat piece of meat. Spread the herb, spice, and bacon mixture on to the now flattened pork roast. Roll the meat back up and tie with 100% cotton kitchen sting. Line a 9-by13-inch baking pan with a large piece of heavy-duty aluminum foil. Put the meat in the middle of the foil. Add water, wine, vinegar and bay leaves. Carefully bring up the sides of the foil, sealing the meat in a foil packet. Bake until the meat reaches an internal temperature of 145 to 155 degrees F. about 35 to 40 minutes per pound. Check with a meat thermometer. Turn off oven and preheat broiler on low. Make a glaze by mixing 1/2 cup of the cooking juices with 1/2 cup molasses. Discard the rest of the cooking liquid or reserve to moisten meat if desired. Pour the glaze over the meat. Return to oven about 8 inches below the pre-heated broiler. Cook until the roast is lightly browned. Watch carefully as the molasses mixture can burn quickly. Allow meat to rest for 10 minutes before carving. Serve hot or at room temperature. Adapted from "How to Collar a Pig" Eliza Smith, The Complete Housewife, Williamsburg Edition, 1742. Preheat oven to 350 degrees F. Line a baking sheet with foil and spray with cooking spray. In a small bowl combing egg yolks and seasonings. In a large bowl add this spice egg mixture to the ground beaf and mix. Form into small balls, about 1 inch in diameter. Roll them in flour and shake off the excess. Place on the prepared baking sheet, spray lightly with more cooking spray, and bake until lightly browned about 15 to 20 minutes..
Makes about 2 dozen meatballs, each about 1 inch in diameter. Serve with cole slaw and dressing made from mayonnaise, which was unknown in Franklin's kitchen, to mimic an 18th-Century cooked sauce. Mix together and use as a spread or dipping sauce for meatballs. Store unused sauce in the refrigerator. Amazon is featuring a special sale price of $14.68. Price subject to change. 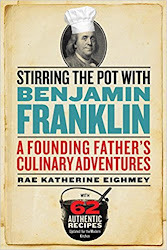 WANT TO READ MORE ABOUT BEN FRANKLIN AND ENJOY MORE GREAT DISHES ADAPTED FROM COLONIAL RECIPES? 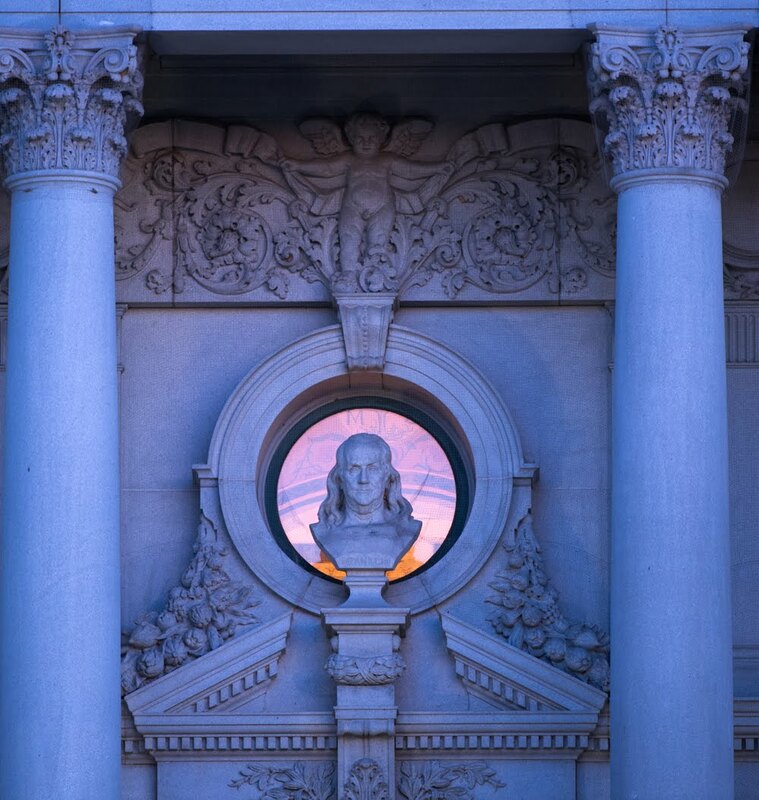 Sculpted by Jean-Antoine Houdon, this bust of Franklin in the window of the Thomas Jefferson Building, Library of Congress, is viewed from the Capitol's East Front Plaza. In Boston Young Ben observed the value of entertaining. Neighbors, prominent church and civil figures, and family gathered around the table hosted by his parents Josiah and Abiah. Benjamin witnessed how his father was respected as the lad learned to lead and influence by listening before speaking. In Philadelphia As a young businessman Franklin formed a social and service club--The Junto. This group of a dozen young community leaders met for evenings of food, drink, and song, while they planned community improvements including forming Philadelphia's first fire company. Later Franklin invited guests to evenings where he demonstrated the power of the new science of electricity. They enjoyed meals prepared by Benjamin's devoted wife, Deborah. 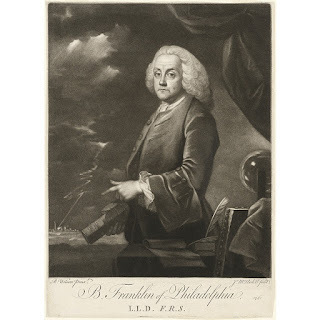 In London Benjamin Franklin hobnobbed with statesmen, businessmen, and fellow scientists in London clubs and while traveling in Europe. In Paris Franklin lived "farm to fork" enjoying the best foods of the French countryside while serving as the emerging nation's leading ambassador. And back in Philadelphia After the successful Revolution, Franklin entertained the new nation's most prominent citizens as they wrote the Constitution that would set the new nation on its firm footing. cranberry pie. Franklin's favorite foods. "First I enjoyed Eighmey's Stirring the Pot with Benjamin Franklin as a reader, and I found myself engrossed. Then as a chef, I immediately put it to the test in the kitchen and was truly impressed. This book offers a new viewpoint on one of our most familiar Founding Fathers." Walter Staib, A Taste of History host, creator, and executive producer; City Tavern Chef and proprietor. "An inviting recipe for a Franklin biography and one that is entertainingly presented. It is both well sourced and well sauced. Enjoy!" "We've all been taught to believe that only one of the Founding Fathers was a true gourmand. Well, roll over, Thomas Jefferson, because it turns out Benjamin Franklin may be the true founding foodie father of this country." Rae Eighmey's portrait of Ben Franklin is like a five-star meal prepared by an Iron Chef--it's irresistible. She reveals a facet of the most lovable of the Founders that other biographers have missed: Benjamin Franklin, Founding Food Hound. And with sixty-two period recipes updated for contemporary cooks, Stirring the Pot with Benjamin Franklin teaches home chefs how to recreate the flavorful specialties of Marie Antoinette's Paris, George III's London, and Franklin's Philadelphia." Thomas J. Craughwell, author of Thomas Jefferson's Creme Brulee.